Bottom club Aston Villa secured their first win under Remi Garde after an awful mistake by Crystal Palace goalkeeper Wayne Hennessey. Hennessey allowed Joleon Lescott's header from a corner to squirm from his grasp and trickle over the line. Palace almost took the lead when Wilfried Zaha hit a post after just 42 seconds at Villa Park. In a much improved Villa display, returning striker Libor Kozak forced a fine save when the game was goalless. Garde deserves credit for his side's first win since the opening day of the season after making sweeping changes to the team defeated at Sunderland last time out in the Premier League. Keeper Brad Guzan and defender Micah Richards were among those left on the bench, with striker Kozak starting for the first time in the league since Boxing Day 2013. Palace started brightly, Zaha hitting the base of the post in the opening minute after Jason Puncheon's threaded pass before Bakary Sako fired over from 25 yards and Damien Delaney got between two defenders before shooting just wide. Villa settled with Kozak impressing in attack and forcing a fine save from Hennessey before the Wales international failed to hold Lescott's tame header, the ball dropping between his feet and rolling over the line. This was a long overdue committed performance, one which Villa fans have been crying out for. But despite a highly encouraging result, Villa remain in deep trouble at the bottom of the table, eight points from safety with 17 games remaining. Yet Garde's new-look team showed more heart and energy in these 90 minutes than they had displayed in the previous 19 games since the opening day win at Bournemouth. A huge turnaround in fortune is needed to get out of the mess they are in but this was a move in the right direction, a far cry from the lacklustre performance in the FA Cup third round draw at League Two Wycombe which angered their fans so much. What has happened to Palace? Away wins at Chelsea and Liverpool seem a long time ago and Alan Pardew's side are now without a win in four league games. Victory at Villa Park would have put them level on points with sixth-placed Manchester United but talk of Palace gate-crashing Europe next season is premature after a lacklustre display. There are some big tests around the corner for Pardew's men and they will certainly have to perform much better than they did against Villa. Joleon Lescott (centre) was a commanding presence at the heart of Villa's defence as the hosts not only recorded a rare win but also kept a clean sheet for the first time since 8 November. Aston Villa manager Remi Garde: "We won only 1-0 but we created many good opportunities. "We earned our luck by being very aggressive on the ball. We didn't sit back after we scored, we tried to score a second. We had a very good attitude." Crystal Palace manager Alan Pardew: "A lot of things went wrong. "We lacked energy, we lacked quality, one of our poorest displays of the season. Villa really deserved their victory - they worked so, so hard. Aston Villa recorded their first Premier League win in 20 attempts, having lost 14 of the previous 19. 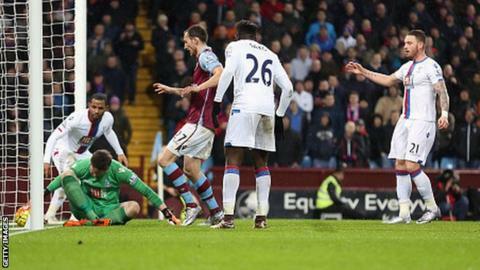 The past eight league meetings between Villa and Crystal Palace have produced just 11 goals. Palace have failed to score in four successive top-flight matches for the first time since February 1998. This was Villa's first home Premier League win over Palace since March 1998. Palace have kept just two clean sheets in their last 16 Premier League away matches. Villa have only scored a first-half goal in two of their last 16 Premier League games and in none of their past six. Despite victory, it does not get any easier for Aston Villa with second-placed Leicester City visiting Villa Park on Saturday (17:30 GMT). On the same day, Palace are at third-placed Manchester City (15:00 GMT). Match ends, Aston Villa 1, Crystal Palace 0. Second Half ends, Aston Villa 1, Crystal Palace 0. Corner, Aston Villa. Conceded by Yohan Cabaye. Corner, Aston Villa. Conceded by Pape Souaré. Substitution, Aston Villa. Ciaran Clark replaces Carles Gil. Offside, Crystal Palace. Yohan Cabaye tries a through ball, but Marouane Chamakh is caught offside. Attempt missed. Scott Dann (Crystal Palace) header from the centre of the box is too high. Assisted by Mile Jedinak with a cross. Marouane Chamakh (Crystal Palace) wins a free kick on the right wing. Attempt missed. Jordan Ayew (Aston Villa) right footed shot from the centre of the box is just a bit too high. Assisted by Ashley Westwood. Offside, Aston Villa. Carles Gil tries a through ball, but Libor Kozák is caught offside. Jordan Ayew (Aston Villa) wins a free kick on the left wing. Substitution, Crystal Palace. Mile Jedinak replaces James McArthur. Offside, Aston Villa. Ashley Westwood tries a through ball, but Libor Kozák is caught offside. Jordan Veretout (Aston Villa) wins a free kick in the attacking half. Attempt missed. Connor Wickham (Crystal Palace) right footed shot from outside the box is too high. Assisted by Pape Souaré. Jordan Veretout (Aston Villa) is shown the yellow card for a bad foul. Substitution, Crystal Palace. Marouane Chamakh replaces Bakary Sako. Goal! Aston Villa 1, Crystal Palace 0. Joleon Lescott (Aston Villa) header from the centre of the box to the centre of the goal. Assisted by Jordan Veretout with a cross following a corner. Corner, Aston Villa. Conceded by Damien Delaney.